A top prospect with the Browns, he drew criticism from the start for lack of enthusiasm and half-hearted effort with the glove. St. Louis passed him on to two other tail-end clubs, the Athletics and Pirates, who soon had enough of him. By the time he joined a pennant contender, the 1951 White Sox, he seemed determined to live down to his reputation as a man who cared about his batting average and little else. Robert Bernard Dillinger was born in Glendale, California, on September 17, 1918. After his parents divorced when he was a child, he lived with his father, Charles Henry Dillinger, a commercial artist. 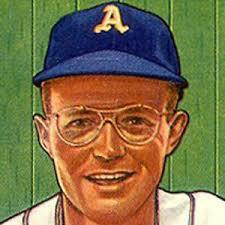 Slightly built with reddish blond hair, Bob wore glasses from an early age, but he became a star in baseball, basketball, and football (without the glasses) at Glendale High. He was named an All-Southern California halfback at 5-foot-11 and around 165 pounds. Football won him a scholarship to the University of Idaho, but he broke his collarbone twice and gave up the game to concentrate on baseball. He dropped out after his sophomore year. Back home in the Los Angeles area, he played second base for the Pasadena Merchants, a top semipro team. The Merchants manager, former big leaguer Jack Fournier, signed Dillinger for the Browns. He began his professional career in Class D ball at Lincoln, Nebraska, in 1939. Speed was his game; he led the Western League with 67 steals and topped the Class C Mid-Atlantic League with the same number the next year. A right-handed batter, he hit over .300 both times. After the 1940 season Dillinger married Eleanor Clausen, his girlfriend since junior high. Their daughter, Judith Ann, was born three years later. He moved up to Class A-1 San Antonio in 1941 and Double-A Toledo in 1942, where he played third base and shortstop. He had established himself as a prize prospect before the military draft took him. Despite the hype, Dillinger couldn’t dislodge the Browns’ wartime third baseman, Mark Christman, in 1946. He started only 50 games, batting .280, while Christman hit .258. When Dillinger did get a chance, he reeled off an 18-game hitting streak in August and September. But the Browns sank to last place in the standings and in attendance. Strapped for cash as usual, the club sold its slugging shortstop, Vern Stephens, and the pitching staff’s leading winner, Jack Kramer, to the Red Sox for a reported $310,000 plus a handful of forgettable players. It was the beginning of annual fire sales that stripped the team of its best talent, demoralized the players who were left behind, and eventually led to the failed franchise’s transfer to Baltimore in 1954. Did he undergo a personality transplant? More likely, the St. Louis writers invented some of it. Several of them were homers who puffed up Browns players. Dillinger enjoyed the biggest day of his career at Yankee Stadium on July 16 as the Browns defeated New York, 10-4. That was remarkable enough — the Browns beating the Yankees — but Dillinger beat the Yanks’ ace, Allie Reynolds, like a drum. His third-inning single drove in St. Louis’s first run. He singled again in the fifth and stole second, then clubbed a bases-loaded triple in the sixth. He added another single off reliever Randy Gumpert in the eighth, stole second again, and scored. In the ninth his fly ball brought in the Browns’ 10th run, a sacrifice fly under today’s rules. That gave him five RBIs on a 4-for-6 afternoon. The next day he went 3-for-5 off Eddie Lopat. A 28-game hitting streak in August and September capped Dillinger’s career year. His 207 hits led the league. So did his 28 stolen bases, at a 72 percent success rate. His .321/.385/.415 batting line included 34 doubles and 10 triples, but just two homers. The Browns lost 94 games, and attendance was again the lowest in the league. Another selloff was in order. The trade talks went nowhere, but the big-money talk got Dillinger’s attention. He told DeWitt he deserved twice his $10,000 salary. Published reports said he got close to that. He earned it in 1949. After sitting out nearly two weeks with a sprained ankle, he hit .431 in July and charged into the race for the batting title, but he told teammate Tom Ferrick he didn’t want to win it: “Hell, if I lead the league this year, I’ll get a $5,000 raise. Next year if I don’t lead the league I’ll get a $5,000 cut.” Dillinger said his goal was to increase his batting average every season so he could count on steady pay raises.10 His hitting tailed off, and he finished at .324, a distant third behind George Kell and Ted Williams. But he pushed his average higher for the third straight year. Though he led the league in steals for the third year in a row, his total dropped to 20, and his success rate to 59 percent. He made the All-Star team as a reserve for the only time in his career. He also led the league’s third basemen with 25 errors; he was among the leaders every year. After losing 101 games, the Browns were open for business again in the fall. Dillinger went to the Athletics with outfielder Paul Lehner for $100,000 and four players. The next day Priddy was sold to Detroit for another hundred grand. It was the Athletics’ biggest splurge since they paid $100,600 for pitcher Lefty Grove in 1924. After years of losing, the club had strung together two straight winning seasons and was hoping to contend for the pennant in 1950 to celebrate the 87-year-old Mack’s Golden Jubilee, his 50th year as manager. On July 20 the A’s sold Dillinger to the Pirates for $50,000.13 Before the deal could go through, all other American League clubs had to grant waivers on him. Yankee general manager George Weiss explained why he passed: “Dillinger doesn’t try and he doesn’t hustle.”14 Other reports said Mack had demanded more than the $10,000 waiver price, trying to recoup some of his investment in Dillinger. He hit .288/.328/.356 in 58 games for Pittsburgh, but the next spring he lost his regular job to Wally Westlake. The Pirates didn’t want to keep a high-salaried 32-year-old on the bench, so they sold Dillinger to the Chicago White Sox on May 15 for something more than the waiver price. The White Sox, who had their own sad history of losing, had jumped into the pennant race and held first place in June and July before falling back to finish fourth. Dillinger should have been a perfect fit for a running club that was called the “Go-Go Sox.” Chicago led the AL in stolen bases, paced by Minnie Minoso and Jim Busby, but Dillinger was no help. He attempted only 10 steals and was caught half the time. He batted .301 for the Sox, but it was a hollow .301 with just 10 extra-base hits in 89 games. Before Opening Day the Sox sold him to Sacramento of the Pacific Coast League. Richards dismissed him: “We have plenty of better players on the club.”20 Barely two years after he was a $100,000 talent, Dillinger was finished in the majors at 32. He took his throwing problems with him, and Sacramento switched him to left field. He could still hit; he won the PCL batting title in 1953 with a .366 mark. He played for more than two years without hitting a single home run. He did go to work, as a construction inspector for the Los Angeles Public Works Department until retirement. The inspector is the man who tells people what they’re doing wrong, a fitting occupation for one who doesn’t much care what others think of him. Bob Dillinger died at 91 on November 7, 2009. 1 Norman L. Macht, The Grand Old Man of Baseball: Connie Mack in His Final Years, 1932-1956 (Lincoln: University of Nebraska Press, 2015), 450. 2 Walter E. Dobbins, “Links Clip Toledo Club in 10th, Meet Elks Here Tonight,” Nebraska State Journal (Lincoln), July 11, 1939: 9. 3 L.A. McMaster, “Browns ‘Mr. Speed’ Dillinger Goes on Display,” St. Louis Post-Dispatch, February 21, 1946: 4B. 4 Dent McSkimming, “‘It’s Browns, Not Me, That Changed’ — Dillinger,” St. Louis Post-Dispatch, May 9, 1947: 8C. 5 W. Vernon Tietjen, “Galehouse to Face Tigers’ Newhouser Here,” St. Louis Star-Times, April 14, 1947: 20. 6 Ray Gillespie, “Hats Off!” The Sporting News, May 5, 1948: 17. 8 International News Service, “Everybody After Dillinger Except F.B.I. As DeWitt Asks ‘What Am I Bid?’” St. Louis Post-Dispatch, December 10, 1948: 10D. 9 Gillespie, “Browns Refused A’s $300,000 Offer for Priddy, Dillinger,” The Sporting News, February 1, 1950: 12. In early 1949 DeWitt had just gotten a loan from the American League to finance his purchase of the Browns. There were suspicions — denied by all concerned — that the league had ordered him not to devalue the franchise by selling more stars. 13 Other reports put the price tag anywhere from $35,000 to $100,000. Branch Rickey, who became the Pirates general manager later in 1950, gave the $50,000 figure. Pittsburgh Press, May 18, 1951: 35. 14 “Weiss Explains Why Yankees Passed on Dillinger,” The Sporting News, August 2, 1950: 9. 15 Al Abrams, “Sidelights on Sports,” Pittsburgh Post-Gazette, May 17, 1951: 14. 16 Brad Willson, “Veteran Barlick Honored as Umpire of Year,” The Sporting News, February 20, 1971, 30. Dillinger struck out the first time he faced Blackwell, on August 15, with Barlick behind the plate. But he singled off the right-hander later in the game. 17 Edgar Munzel, “Hustle Specialist Richards Gets New Case in Dillinger,” The Sporting News, May 30, 1951: 4. 18 Rich Marazzi and Len Fiorito, Baseball Players of the 1950s (Jefferson, North Carolina: McFarland, 2009), 90. 19 Edward Burns, “Dillinger Sold to Sacramento by White Sox,” Chicago Tribune, March 25, 1952: B2. 20 Associated Press, “Dillinger, Who Cost $125,000, Heads Back to Minors,” Baltimore Sun, March 25, 1952: 13. 21 Al Wolf, “Sportraits,” Los Angeles Times, May 31, 1955: IV-2. 22 Marazzi and Fiorito, 89.